A woman brazenly stole a credit card from a Danville shopowner's elderly mother and proceeded to go on a shopping spree last week, according to Danville police, who released surveillance video of the theft. The shopowner, who did not want to be identified, said the suspect targeted her 93-year-old mother, who was helping her in the store on busy Hartz Avenue in the East Bay town last Friday. She gave footage from her store security camera to police. "The person reaches into the purse, grabs only the credit card, then leaves the store," said Lt. Allan Shields, describing the video. In the upper left of the frame, the victim can be seen, oblivious to the fact the suspect just stole her credit card from her purse. Amy Edlund, who runs Christe James Jewelry Works down the street, said it isn't a typical theft for shops in the area. "It's typically something much noiser, a smash and grab, or they will grab something and they run out the door," she said. "But to see that kind of calculated sneakiness kind of makes you feel a lot more violated. "We tend to think that we are really safe, but there are predators out there everywhere," Edlund added. 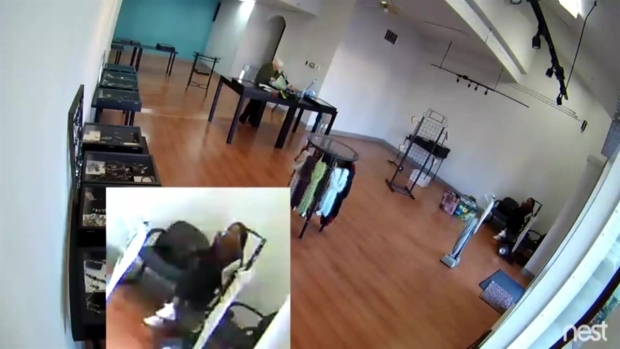 In the video, the suspect initially appears to be interested in buying jewelry, then quickly leaves the store after stealing the credit card. Police said she immediately started using the card at a local grocery store. Authorities said the victim found out about the theft only after her credit card company contacted her about unusually high spending. "It's a good reminder to be cautious and to be watchful and to put things away where they can't be stolen," business owner Kit Noel said. Police said they've received several calls from people who recognize the suspect in the video, but so far, no arrests have been made.